Vintage space toys can be divided into two chronological sections; before, and after GI Joe. Of course, I am not inlcuding the Star Wars period. Before 1964, when GI Joe was born, space toys consisted of robots, ray guns and playsets. After GI Joe, action figures were all the rage and we were introduced to figures like Major Matt Mason, Billy Blastoff and Moon McDare. I've compiled a handful of my favorites from primarily the pre-GI Joe period, focusing on playsets and vehicles. I've only scratched the surface as there are mountains of material available on ray guns and robots, the two most popular pre-action figure space toys. Actual descriptions from catalogs or box art were used whenever possible. While the reading may come off as a little terse, I think it gives the article a bit of a retro feel. So, go get two "D" cell batteries, strap yourself in, and get ready for chrome, blinking lights, dials and spring-launched rockets and missles. 5-4-3-2-1, blast off! These space cars were beautiful Sears exclusives in 1961. There were 3 cars that ran on 2 "D" batteries. The following descriptions are from the 1960 Sears Catalog. 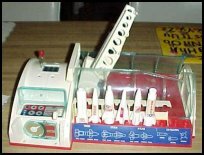 Moon Mobile Rocket Launcher "Giant sparking rocket zooms up and away when count down indicator lever is activated. Launching tower moves on track, tilts to 65 degrees or vertical. 6 head lighs (2 red, 2 green flashers, 1 constant white beam); special beam purifiers "radio-active" ground. Steel; moves forward or reverse on heavy duty tread. Electric motor." Moon Mobile Scout Wagon "Same sleek steel chassis as above, same battery of 6 headlights. Carries its own explorer plane for long distance reconnaissance. Plane is raised or lowered by crank-operated crane which moves on track. Craft moves forward or reverse on heavy duty tread. Electric motor." Moving-Shooting Commander Tank "4 big cannon fire 2 or 4 rounds at a time - 24 in all - and eject casing after each shot! Lever operated triggers. Forward or reverse on 12 wheels and tread. Red and green lights. Steel. Electric motor." Post a Want to Buy ad for a Moon Mobile in the Sears Exclusive Classifieds! 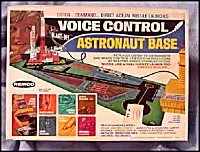 The Astro-Sound sets featured a Satellite and a Robot that would talk when slid along the sound track. Short on accessories but a clever variation on the pull-string record theme. Ideal made several neat helmet and belt combos in the '60s, including the Batman and Steve Canyon sets. 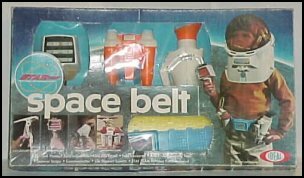 The Space set let little Billy USA stagger around in the backyard wearing his authentic child-sized space helmet with microphone, and utility belt, complete with 4 essential moon exploration tools. This is one of the most popular of the Marx Playsets. This baby came with a tin litho building, space record, fencing, four-stage rocket, bomarc rocket, somarc missle and launcher, scientists gantry and launch pad, flying saucer, searchlight, radar antenna, space capsule, flying saucer and launcher, helicopter, fuel truck, missle trailer, dome, fuel tanks, scientists, NASA ticket, missle men and more! 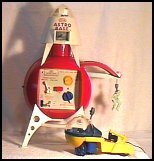 The Explorer was essentially the same toy as the Launching Station except that it was hand-held, almost flashlight sized. Remco and Topper made many similar toys in the '60s. Remco produced the Monkey Division line and Topper; the Johnny Seven series. Remco made The Mighty Matilda and Topper; the Battlewagon. Remco; Johnny Reb. Topper; Mighty Mo. During this raging rivalry, Remco and Topper made some swell cockpit and dashboard toys. These mockpits simulated the driving experience, allowing children to pretend like they were were in control of a car or ship. 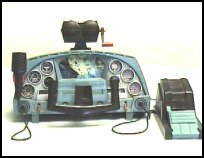 The Spacemobile, by Topper, included a working flight panel, pedal, microphone, steering and ray gun. 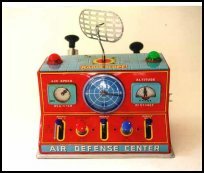 Set this thing up on the kitchen table, douse the lights and you were in orbit! 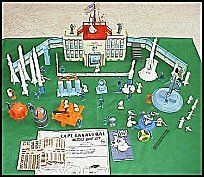 This toy was probably the sole competition for the Marx Cap Canaveral playset. Typical Topper in terms of gizmos, gimmicks and gadgets. This set came with plastic figures, launching rockets, firing missles, working lights, train and more!